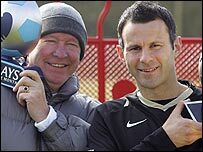 Manchester United's Sir Alex Ferguson and Ryan Giggs have walked away with the Barclays awards for February. Manager of the Month Ferguson and Player of the Month Giggs have helped guide league leaders United to three victories in the last month. Giggs scored at Tottenham and also fired in a volley against Fulham. It is the second time Ferguson and Giggs have won joint awards this campaign, having both picked up the accolades in August 2006.